Don your favorite red, white and blue attire and head to Talking Stick Resort and Casino Arizona for the Fourth of July. 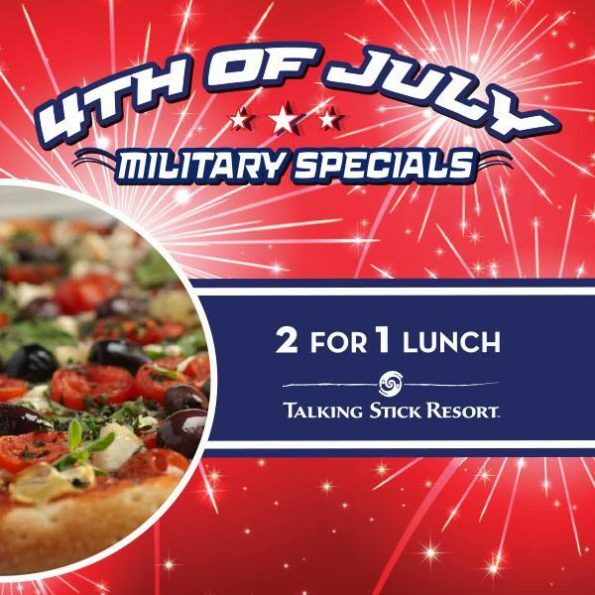 Both properties are honoring Independence Day with dining specials, and the entrees will put foodies in a patriotic mood after the first bite! Guests are invited to head to the 15th floor on Sunday, July 3 and reserve a west-facing window. They’ll be able to enjoy mouthwatering fare and breathtaking views of the fireworks show at Salt River Fields at Talking Stick. There will be no minimum spend requirement from 5-7 p.m. However, west window tables will have a minimum spend requirement of $100 per person when reserved from 7:30 p.m. to close. To make a reservation, call (480) 850-8606. Visitors can also experience the Independence Day fireworks show at Salt River Fields at Talking Stick from the comforts of Degree 270. There’s no cover charge for the event on July 3 and the lounge will be open during normal hours of operation. Wandering Horse Buffet is offering a two-for-one lunch deal exclusively for veterans and active-duty military. To take advantage of the special, guests will need to present a valid Veteran’s card or military ID, as well as a Players Reward Club (PRC) card. Registration for a PRC card is free. To learn more information or to sign up to become a PRC member, visit the Players Reward Club desk at either property or http://www.casinoarizona.com/rewards.aspx. The restaurant will serve a holiday breakfast menu from 6 – 11 a.m. It will include a cinnamon roll French toast entrée complete with two eggs and a choice of ham, sausage or bacon for just $8.95. The dinner special menu will be available from 11 a.m. – 9 p.m. and will include a barbecue chicken dinner for $8.95. A vegetable barley soup will be up for grabs at the low price of $3 and a peach cobbler with vanilla ice cream will be available for $3.25.